We first learned about Bren Smith, of GreenWave.org and Thimble Island Ocean Farm, after watching his talk at TEDx Bermuda. A former Atlantic Cod fisherman turned seaweed farmer, he told a story of ecological redemption. He was mesmerizing, and we had to track him down to hear his story. 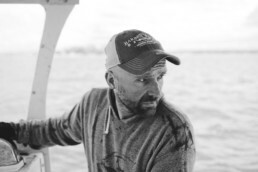 But what makes him even more interesting than his new ‘climate cuisine’ is his commitment to fundamentally changing the land farm model and empowering a new generation of ocean farmers that can actually make a living. I like to describe it as an underwater garden; a way to grow a huge amount of food, with zero inputs – no fresh water or fertilizer – and a restorative effect on the oceans. 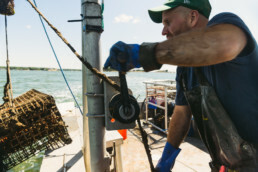 We grow kelp, oysters, clams, scallops and mussels on a 20-acre farm on the coast of Connecticut. WHAT ARE THE REASONS YOU BECAME INTERESTED IN SEAWEED? 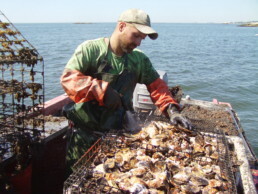 At first, it was failure as a commercial fisherman. I literally saw the last cod fished, but I loved my job and wanted to find a way to keep working the seas. It turns out, there are 10,000 edible types of seaweed globally. Some varieties have more calcium than milk and more iron than red meat. Beyond that, it’s a cattle feed, biofuel, fertilizer and an ingredient in cosmetics. With market development, big companies are buying forward contracts that guarantee farmers like me a market for our product 3-5 years out. WHO IS LEADING THE WAY TO CHANGE PERCEPTIONS OF SEAWEED AS A FOOD? WHAT GETS YOU EXCITED? Many cultures have used seaweed for centuries – Italian great-grandmothers cooked with it, seaweed snacks were everywhere in Newfoundland where I am from, and Peru and Chile have a ‘Kelp Highway’ that fed many hungry mouths. 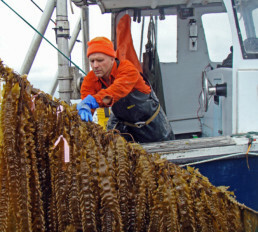 Industrialized food pushed sea vegetables off the plate. We need to revive that history. But we’re trying to get Americans to eat something disgusting. It takes incredible creativity, but that’s okay because we have to. Zero input food is going to be the most affordable food in the future. Kelp is really neutral tasting. I call it the gateway drug of sea vegetables. Chefs have gotten really excited about it. Brooks Headley, of Superiority Burger, makes BBQ kelp noodles with parsnips that sell out at his Manhattan restaurant. The head chef at Google created a burger with 33% kelp and 66% beef. It’s absolutely delicious. 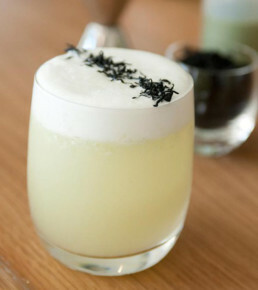 Other examples are seaweed bouillon cubes (as flavorful as beef), called ‘Umami bombs’ and SeaShine, seaweed based moonshine. 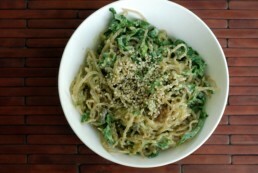 There’s a cookbook called SuperFood Sea Greens and Kelp-Fed Beef is coming. SO KELP-FED BEEF IS A THING? WHY? Yes. Kelp already absorbs the methane in the atmosphere that we know is warming the climate, but if you feed kelp to cattle it also reduces 90% of the methane output…yes, I mean what comes out of cows’ butts. 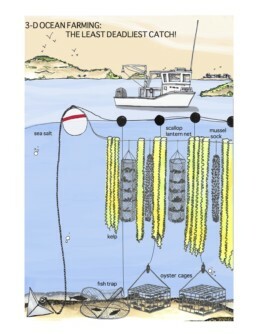 WHAT ARE THE CHALLENGES YOU FORESEE IN TAKING SEAWEED FROM THE FRINGE TO MAINSTREAM MEALS? Well, there is currently no fresh packaging solution for seaweed. Sea plants really don’t like oxygen. This is really needed to take it out of fine dining to the street level, to de-sushify it. And we need a global market analysis and nutritional analysis on all the sea vegetables we can grow and eat. Today, we only have nutritional analysis on the seven most common varieties. WHAT DO YOU MOST WANT TO ACHIEVE? For me, it’s not about becoming the Kelp King. When I die, I’ll be happy if I have helped set up a thousand new farmers. What is also important to me is protecting people’s relationship with the oceans, protecting ‘the commons.’ Anyone can boat, fish or swim on my farm. I just have the rights to grow there. YOU’VE MADE YOUR OCEAN FARM ORGANIZATION GREENWAVE AN ‘OPEN SOURCE’ MODEL. WHY? Because we have traditionally asked too much of our farmers. No one is making a living farming the land. But my failure at commercial fishing helped me imagine a new model, one that creates jobs, not just profits, to lift communities out of poverty. It has to be replicable to get to scale; that means creating hundreds of 20-acre farms. For that to happen, we need a low cost of entry. I call it the ‘nail salon model.’ All you need is $50,000 and a boat. I’ve had interest from people in every coastal state in the US as well as Brazil, Chile, Romania, S. Africa, Costa Rica, Vietnam, and the Phillipines. People want to know how to do this. Farmers have to commit to sustainability training and sharing all their learnings with the GreenWave community. Maybe one day we’ll be big enough to be proprietary, but today, we need to create a foundation for innovation. WHAT IS THE ONE THING YOU WANT PEOPLE TO REMEMBER ABOUT YOUR STORY? We have such a huge opportunity to create a New American Cuisine with sea vegetables at the center of the plate. Think Italian, Portuguese, Farmers’ Markets – it goes way beyond sushi. We need to do it for polyculture, for nutritious food in schools, to create a climate cuisine – whatever your reason – it’s time to start fresh. I READ SOMEWHERE YOU’VE REFUSED MILLIONS OF DOLLARS IN PRIVATE INVESTMENT. It’s important to me to clarify that GreenWave is a hybrid non-profit-for-profit model. I refused the money because we’re not at scale yet. We need to get to 1 million pounds a year. I like to say if “I took your money now, I would lose it.” For now, our focus is on getting the infrastructure and market development to a point where we can give people real jobs. I made $70-$80K as a fisherman, and that’s the type of job we’re talking about. I don’t want to be one of those cute food businesses. There is nothing wrong with that…but no one is making any money.